Valentine’s Day is one of the most beloved of all holidays. Who doesn’t enjoy indulging in the cards, roses and chocolates that epitomize this day of romance? For many couples, Valentine’s Day presents the perfect opportunity for them to make their lifelong vows to one another. Incorporating its many traditions into your event can be a wonderful way to create a romantic, memorable day. Below are some ideas to inspire you. One of the most nostalgic aspects of Valentine’s Day are the wonderful, vintage valentines beautifully constructed of doily hearts and oodles of lace. Use these heartfelt cards as inspiration for your own wedding invitations. An intricately-cut heart overlay tied with red ribbon can be both a romantic and sophisticated choice. 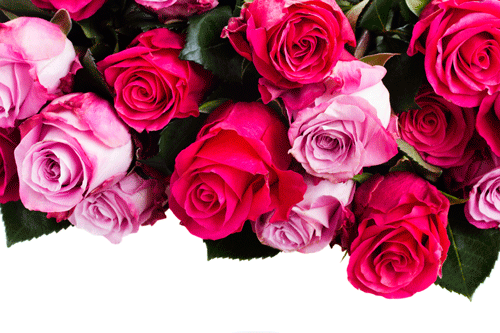 Few things symbolize love and romance as much as a bouquet of deep red roses. Tying these into your Valentine’s Day vows can add romance and drama to the event. You can include them in your bouquets, add them to your table arrangements or even scatter them down the aisle. When planning a wedding on a specific holiday, it is always important to keep your guests in mind. Remember you are asking them to “give up” their other plans and spend the day at your event. One way to accomplish this on Valentine’s Day is to help them feel the love and romance too. Requesting the DJ play lovey ballads or showcasing a kissing booth can both be great ideas. Favors can be an endearing way to share a token of appreciation with your guests. They also present the perfect opportunity to further tie in the Valentine theme. Sweetheart candies wrapped in pretty boxes would be a great option. You could also hire a caricature artist to provide custom drawings for your guests to take home with them. When planning a Valentine’s Day wedding it is important to also consider your personal style when selecting your design choices. Whether you prefer an elegant affair or something a little more fun and eclectic, there are many ways to incorporate the holiday of love into your special day. For help in planning your event, contact the team at Windermere Elegant Weddings and Special Events. We have experience in helping couples plan their perfect, romantic wedding celebration.